Besides the ordered EP of Caroline, the label Hyena Records has also sent us the latest album of Isäntä Meidän. The album entitled "Toinen Tuleminen" [The Second Coming] represents, logically, the second release of the quintet from Kokkola/Finland. The album cover promises Metal and even though the press release specifies the genre with Heavy Metal and Heavy Rock, in the end it`s rather Power Metal than anything else - and thus it isn`t really my taste. BUT, the opener "Vapise Vanha Valta" has a nice intro, starts in a strong way and the chorus knows how to please even a non-Power Metal fan like me. The guitar sound on the second track "Mies" is intoxicating as well. The dramatic shouts - which are typical for this genre and appear besides "Mies" amongst others on "Mestarin Kitaan" - are again a matter of taste. It`s not mine and the longer the record runs, the more annoying becomes the Power Metal part. But Isäntä Meidän are not afraid of making excursions into other musical fields as well and so it comes that "Paha Nalle" sounds very rocky while "Kääpiöt Tanssii" is a pure instrumental piece, sounding like having been recorded at a jam session. And with "Vastavoimaa" there is all of a sudden a song, which really fits into the stated genres Heavy Metal/Heavy Rock. What a pleasant surprise! After this follows "Neiti Dominus" with a guitar riff at the beginning that reminds me amongst others of Sum 41. No joke! Listen to the intro of "Pain For Pleasure" by the four punk rockers from Canada. And talking about "four": At the moment, also Isäntä Meidän are consisting of four band members only. Just recently, vocalist Jouni Nikula left the band to the surprise of all. 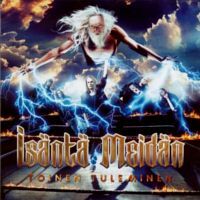 It`s sad `cause if even a non-Power Metal fan can get something out of the album - simply because it serves more than that one genre - "Toinen Tuleminen" must be a highlight in the CD collection of everyone, who is a true lover of bombastic sounds.